One of the things we did enjoy in Brussels was chocolate. We hit multiple chocolate shops and bought little bags of Belgian chocolates of all fillings. I considered it research of course. Our favorite turned out to be Galler (pricey) and Leonidas (same taste but very reasonable). By the end of the day I think we had consumed a kilo each! The food choices were also more interesting than in Holland. We had a good fixed price meal similar to Paris for 12 euros a person. 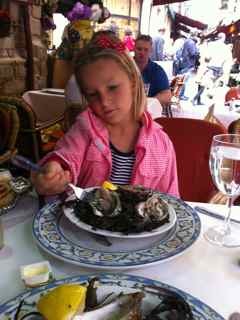 The Littles and I had raw oysters with main course of 2 types of fish and lamb. 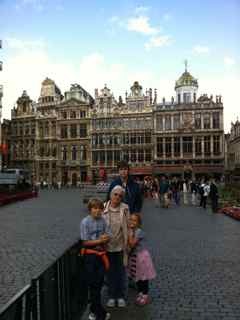 Then later for dinner we were tired and had a great and cheap meal from a Greek place near the Grand Place. The food is reported to equal Paris. 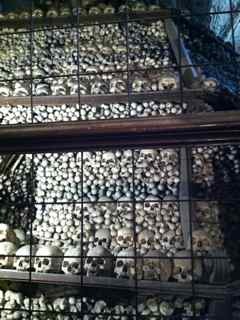 We did not find this but perhaps we were in the wrong areas as we only hit tourist spots. Anyway we are in support of the guidebooks in suggesting only visiting Brussels on your way to Brugge or other places. I remember it from childhood so it was interesting to go back but I wouldn’t bother going as a regular tourist spot. If you do then plan on one day tops. Footnote to this. We were shopping in the covered gallery mall in The Hague later on and ran across a little Leonidas chocolate shop! Prices are the same and quality just as good. Phew we can renew our stock! 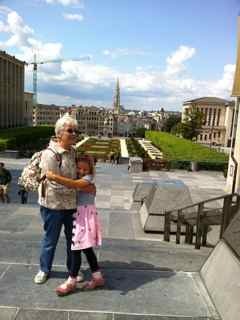 We headed out to Brussels this last weekend because we wanted to explore some places we used to live when I was a child and mom was at SHAPE teaching for the British Forces Schools. We got cheap weekend tickets to Brussels as there are Benelux specials going on right now – 50% off from Friday to Sunday. Our tickets were only about 36 euros for adults and 5 euros for the children round trip. It was a sunny day in the 70s so perfect for sightseeing. Train travel is so much fun and we all enjoy it so of course it starts things off well. 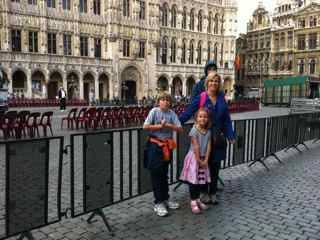 We pulled up into Brussels and got off the train and I was immediately transported back to my youth. Nope – not for the architecture in Central Station but sadly for the smell. The overwhelming smell of urine throughout the streets of downtown Brussels was strong from memory in the 70s and I am sad to say still exists. And nope I did not influence the children’s thoughts – they kept commenting on it and holding their noses! 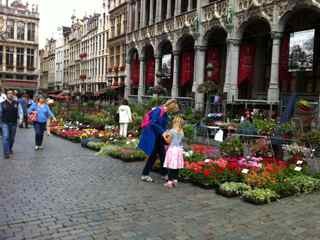 The Grand Place is pretty and a short walk from the station. Filled with lovely old buildings and cafes it is lively and fun. The few streets around it are also vibrant and fun. 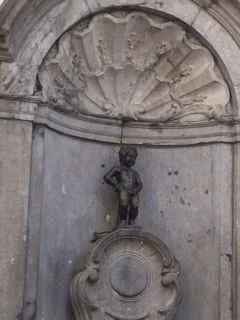 Funnily enough the most known site of Brussels is a tiny fountain on a side street titled Manneken Pis – the little statue of a boy peeing. It used to be seen as rather rude and people side stepped it but now the tiny statue is given fancy outfits for holidays and revered on every postcard and shirt from Brussels. Max and Charlotte were stumped as to why it should be so highly visible and a landmark as after visiting it, they claimed it rather sad. Charlotte said it was sad and perhaps the reason Brussels smells of “pee” is because they celebrate a statue of a boy peeing. Rather insightful thoughts from a 6 year old. Spread over three floors this has a large collection of this artist’s surreal work. Having been to the Dali museum near our home in Florida and the Escher museum in The Hague, we had high expectations of this. 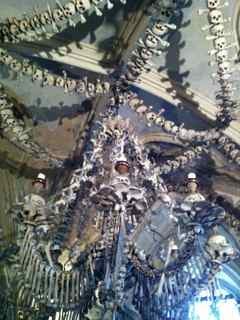 We saw some neat pieces but sadly it did not impress highly. Much of the work was his publishing times when he was doing corporate advertising etc. And of course there was a whole separate section for 18 plus that we did not visit. I AM glad they put that separate though! 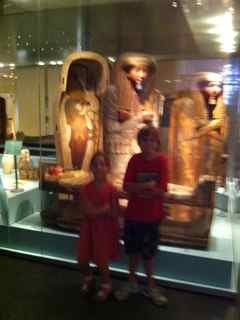 This is one of the top ten Egyptian museums and has lots of mummies and artifacts which made Max excited. There were very few people in the museum and it was a relaxing walk around for a few hours. There were great children’s interactive pieces and a nice bookstore and café. 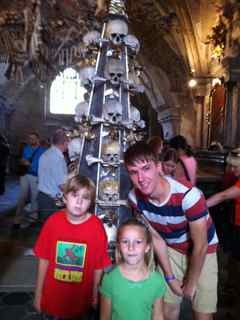 Children were free and I only paid 9 euros so a great deal. Sorry for the poor picture but the mummies were great! We discovered a lot of other good museums in Leiden we want to go back to but just didn’t have time today. 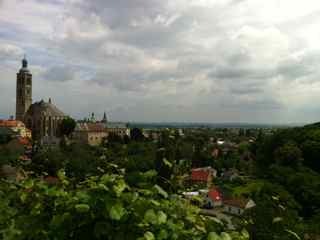 We did see the Pilgrim museum and where Rembrandt went to school. 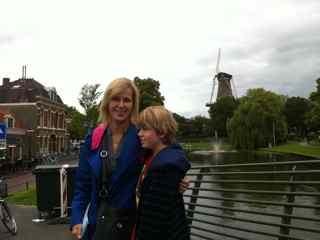 There is a great windmill near the train station that you can climb up in and learn about the history. The steps are a bit narrow, steep and tricky to come down after climbing about 5 floors – not accessible for all! It was also market day (Wednesday and Saturday) and this was huge. The first one we found just straight down from the station and near where the boat trips go from (we are planning one of these for next time ) there was a neat antiques market. Then the main one was further into the downtown area and here were fruit and vegetables, flowers, snacks, clothing, material, fish, and everything you could want. It was great but crowded. We also found a British and Australian shop that had loads of Tesco products – hey we miss home and it’s so close! The weather was nice so every outdoor café was packed with people. They all sell basically the same things: drinks, sandwiches or salads. There are toasties or brodjes Cheese, ham, or sometimes tuna either toasted or on a baguette. This seems to be the Dutch national dish! 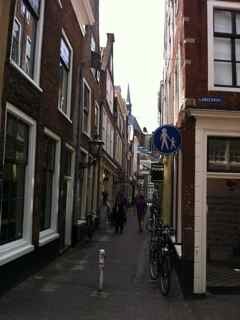 Leiden is an old university town so had a few more “interesting” places too. The Littles spotted an Asian restaurant and fell into raptures at the pictures of sushi. They are huge sushi eaters but it is very expensive in Europe so have not had any for 2 months now. The price at this one was reasonable and 12 euros for them, 15 for me for all you can eat! This was not a buffet and they made all sushi to order plus some small cooked tidbits. It was very good although we all ate too much and needed a nap after! The Littles proclaimed this a wonderful day. Mummies and sushi and NO rain! I agreed. 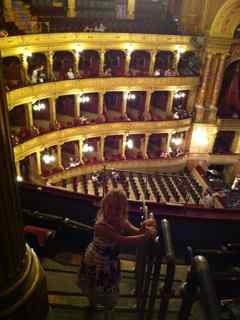 We wanted to see something at the Hungarian State Opera Theater as it looked so lovely. There was either opera/symphony or ballet about 5 nights out of the week to choose from and we got tickets to the ballet Romeo and Juliet as Charlotte is such a lover of dance. 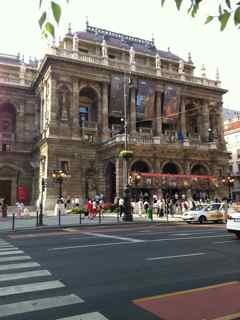 The theater is very impressive and the show was equally so. 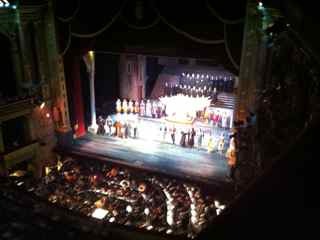 The scenery and the dancers were outstanding. The only downside was the heat in there which made it rather uncomfortable for about the first half. Our tickets were some of the last remaining so up high but at $2,10 per person quite a deal. The most expensive were about $25! People there truly love their classics. I wish American cities had this much available at this quality and price. We were browsing in one of the used book stores near our apartment in Budapest (I got a neat atlas from the 50s) when an elderly, scruffy man came in trying to sell two very old books to the store owner. The owner said he couldn’t take them and when I looked at them he said they were religious (“theology”) but neither person’s English allowed anymore than that. I ended up buying one of them from the old man as I couldn’t resist — books are a passion of mine. 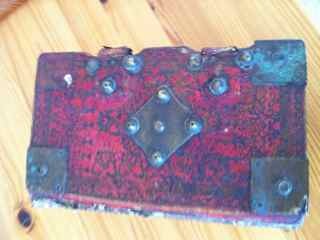 I have no idea what it is exactly but it’s leather bound with metal clasps. 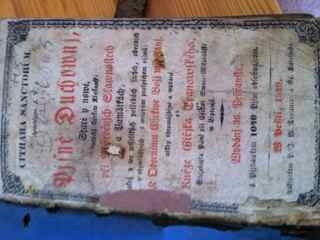 The date is 1849 and it is from Hungary. 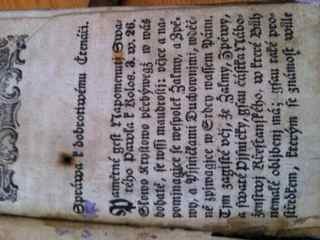 If anyone speaks Hungarian or has insights into what this is I’d love to hear from you.